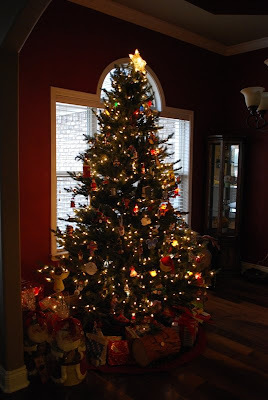 This year my entire family was able to celebrate Christmas together. And we were so happy to get to host the celebration at our new house. My parents, my three sisters and their families, my mother-in-law and Patty and Michelle's mom, Dorothy were all in attendance. That made for 22 people here! It was crazy and tiring, but it was a blast! I loved having them all here. Here we are at gift time. We rearranged our family room to open it up more so everyone could see. 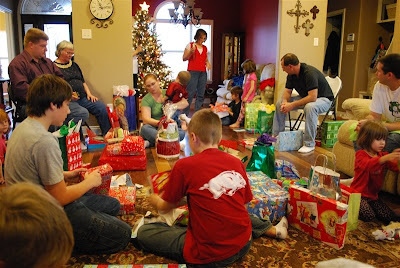 There are ten cousins/kids and they got to open their presents first. It was mayhem! After the kids were done and sent off the play with their new toys, the adults got to open their gifts. We put the seven youngest at our kitchen table. Carson, the youngest of all of them, was in his high chair. 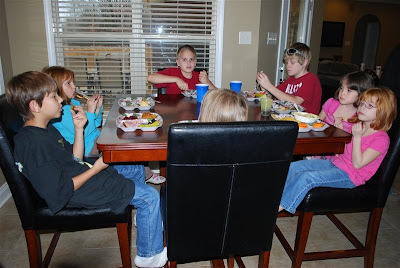 In this photo, starting from the left is Joshua Mullins, Hannah Mullins, Sam Hutchinson, Matthew Hutchinson, Rachel, Courtney Bettis and you can see the back of Rebekah's head. The two oldest cousins...also teenagers...got to sit at the bar. Aaron Mullins is on the left in blue and Andrew Hutchinson is on the right in red. We teased them that this was the "transition bar" - too big for the kiddie table, but not old enough for the grown up table! 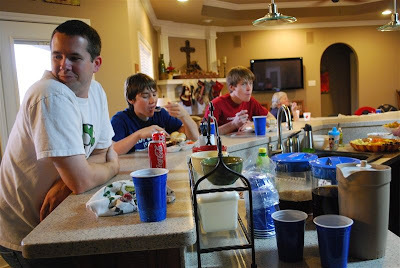 Since we rearranged the family room, we were able to set up four of my scrapbooking tables and all the adults were able to enjoy their meal around one table. I don't remember the last time we were able to do that! 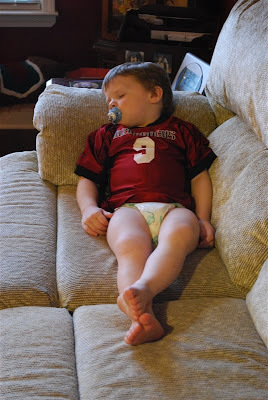 While the adults were finishing up eating and talking, Carson decided he was just pooped out. He climbed up on our couch and went to sleep. Looks comfy, doesn't it?!?! I love how he has his legs all crossed - precious! 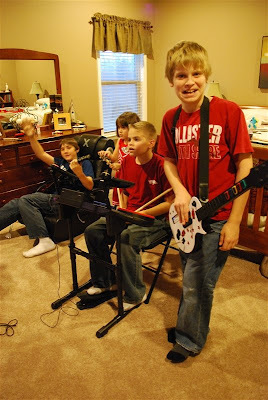 The life saver of the day was our Guitar Hero World Tour band, set up in our bedroom. Most of the kids hung out in there ALL day. I don't think we heard one argument or complaint. They really enjoyed playing this game and many of the others we have. 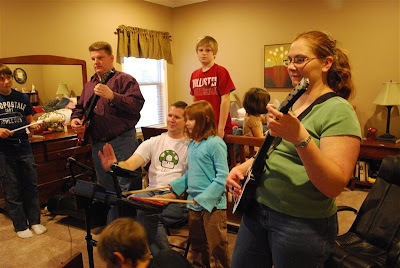 It was nice having the Wii set up in our bedroom, then the adults could still be in the family room and talk comfortably. We were even able to get up a mean game of Mexican Train dominoes while the kids played. Here is a photo of Jon Paul and my niece Hannah. Hannah is Patty's youngest child and she is autistic. She has come along way. I was so happy to hear her saying many more words this visit. She seemed to really feel comfortable in our house and played all day without asking to leave. I was also overjoyed when she wanted to sit in my lap and help me play dominoes. She sat in my lap for about 30-45 minutes and I loved every minute of it. She doesn't volunteer her affection very often. 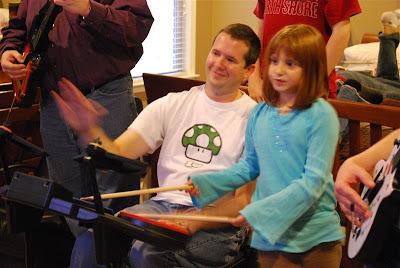 Jon Paul was also surprised and happy when Hannah came over to him on the drums and took the sticks out of his hands and wanted to play along with the other kids. She's precious and we miss her! One last shot of some of the band. They had a lot of fun and I'm glad we had it here for them to enjoy. My sister, Cynthia, and her family all stayed at our house all weekend. We celebrated the weekend immediately following Christmas. 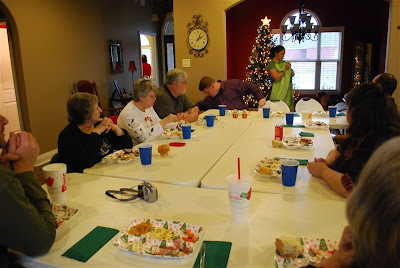 Patty and her family stayed at Michelle's house in Lonoke. My parents drove up from Sherwood for all the festivities. So, our house was nice and centrally located for everyone! I love it that you always have pictures to share. Everyone looks so different. Send your mother my love please. I did not know if she ever got my Christmas card but I think of her everytime I read your blog.